In New York's Times Square, Robert Fitzpatrick, of Staten Island, said he was surprised when the six o'clock hour simply came and went. 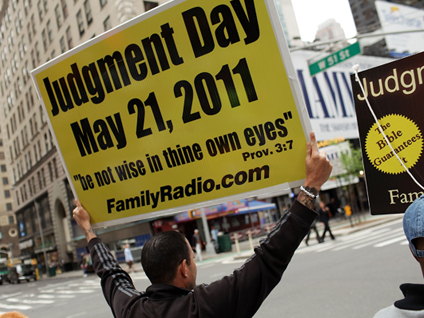 He had spent his own money to put up advertising about the end of the world. "I can't tell you what I feel right now," he said, surrounded by tourists. "Obviously, I haven't understood it correctly because we're still here." Many followers said the delay was a further test from God to persevere in their faith.